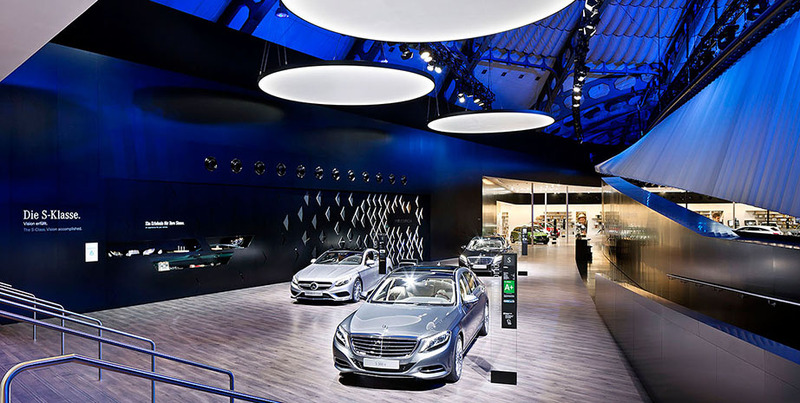 The International Motor Show in Frankfurt (IAA Cars) is a major opportunity to turn the awe-inspiring dome of the trade fair hall into an 11-day long live theatre for the Mercedes-Benz brand. 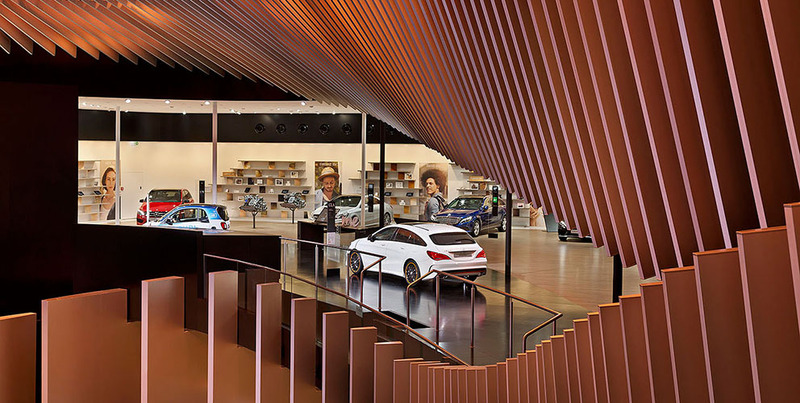 As soon as visitors entered the hall, they were drawn into the diversity of the carmaker’s brand. The exhibition stand had three levels, offering a 97,000 sq ft display area running around all sides of an open arena at the centre. 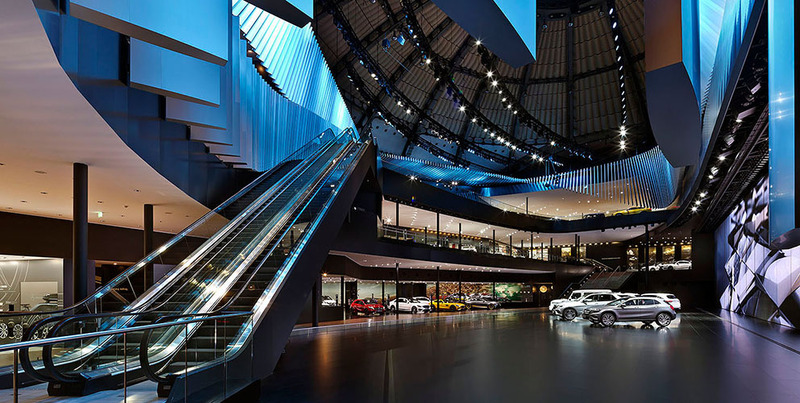 Visitors could glide majestically up on an escalator, rising above the ground level to a height of 40 feet as they savoured the view of each display area and the exhibition stage. Once on the upper level, there was an exhibition, escorting visitors through different topics in different areas, each marked out by its own design. 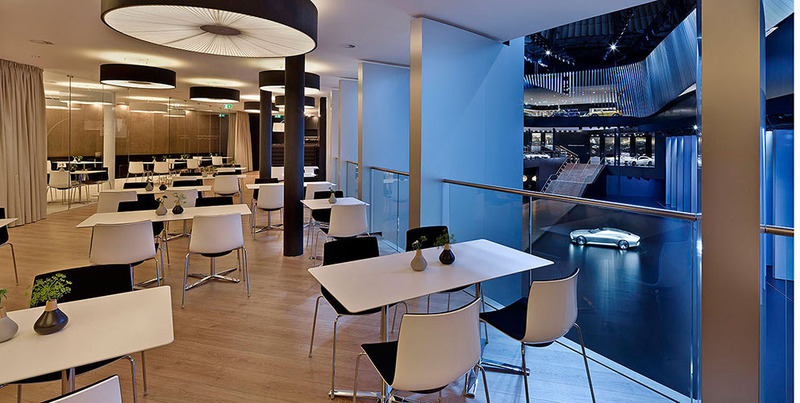 The two levels afforded different views of the 15,900 sq ft stage, with plenty of space to walk around, sit down and simply soak up the atmosphere. 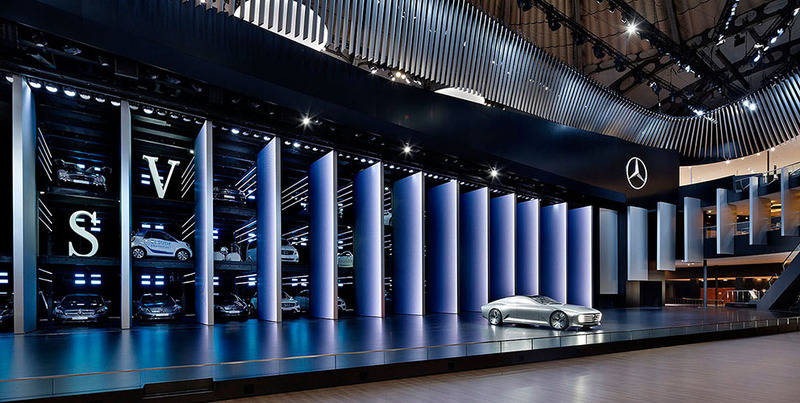 To guide visitors as they walked around the stand, the familiar Silver Flow hovered above like a magical river through the memories of the 100-year-old hall, merging seamlessly into the digital media area on the stage – itself suspended like a majestic, moving, slatted LED curtain. The 400 individual strips that made up this dynamic curtain worked in perfect harmony with the illuminations, which helped move miraculously between different moods and atmospheres. 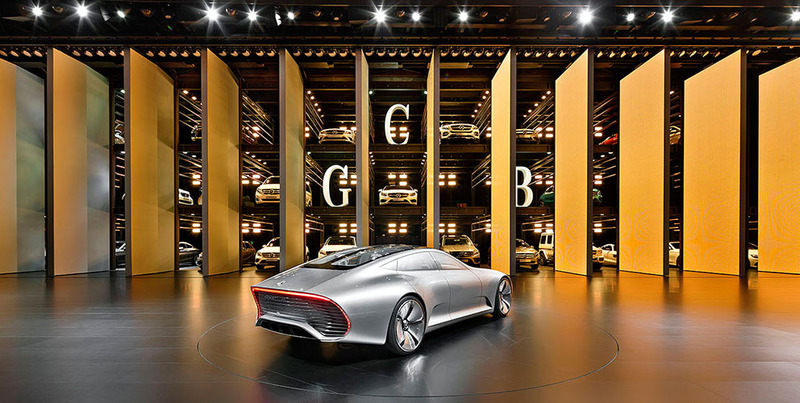 To form a backdrop for the stage, there was a three-storey vehicle ‘shelving unit’, offering an oversized display of different cars from the Mercedes-Benz portfolio. This only became visible by rotating the giant slats of the magic curtain. 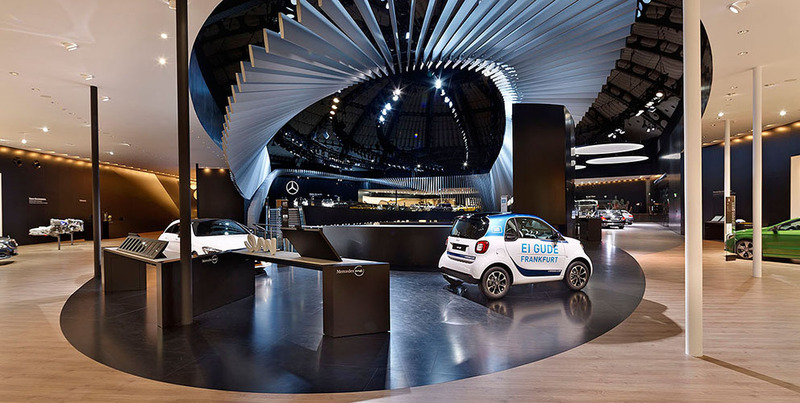 The shows on the stage were also a point of inspiration by showcasing highlights in real time, with actual cars travelling across the stage, video sequences, live images, music and presenters – effectively merging the whole brand into a carefully coordinated choreography of the company. 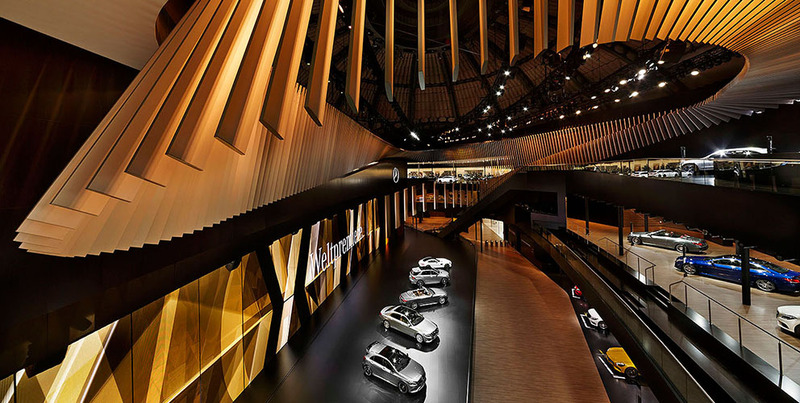 To catch each movement during the drive, there was even a live spider cam over the arena, overlaying images on the screens to blend with touches of augmented reality.